RON KEEL was first noticed in Sweden as vocalist of STEELER, a band that also featured YNGWIE MALMSTEEN. Their less than amicable split-up was noticed over here, but Ron soon struck back fronting his own band KEEL. The most famous incarnation of KEEL consisted of Ron, guitarists Marc Ferrari and Brian Jay, bass player Kenny Chaisson and drummer Dwain Miller. This lot released the band´s second album, “The Right to Rock” and caught the eye of KISS bass man Gene Simmons. The title track will forever be an anthem of the band, but the Gene Simmons produced third album, “The Final Frontier” was also a strong contender including the big hit “Because the Night”. In 1986 they were awarded “Best Band of the Year” by Metal Edge´s readers, and the road ahead seemed paved for glory. But fourth album, “Keel”, was another story, and both guitarists left after touring in support of the album. Replacements were announced in the shape of guitarist Tony Palamucci and keyboard player Scott Warren (WARRANT, DIO, HEAVEN & HELL). The balance seemed lost and one more album, “Larger than Life”, followed before the band broke up in 1989. 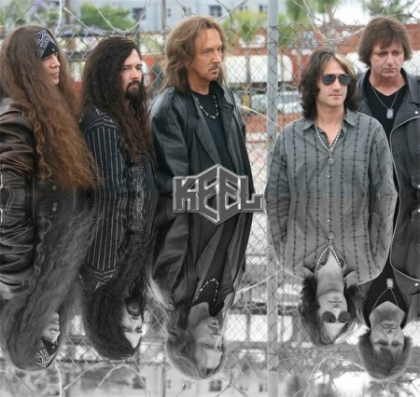 A short reunion took place in 1998, resulting in an album of mainly unreleased songs from previous efforts called “Keel VI: Back in Action" In 2009 a reunion was announced, as well as a new album on Frontiers Records. What caused this, what is true and what is not? Guitarist Marc Ferrari took some time before the Stockholm Rock Out gig to answer my questions.
' Hi Mark, what´s it like being in Stockholm again? - Well, it´s been 24 years, but I still like it! * What about the reunion album, please describe it. - In 2009 we were celebrating our 25th anniversary. It felt like a natural development of the jubilee, plus it was 22 years since the release of our self titled album, it was too many things to celebrate to be missed. We also had some material lying around plus some freshly penned tracks.
' What do you think your old benefactor Gene Simmons of KISS would have thought of you nowadays? - I think Gene should be proud. We met in L.A. a while back but I don´t know if he´s heard the album. I personally like the latest KISS outing “Sonic Boom”, which is also true to their roots. I hope Gene would be like a proud father listening to our latest.
' Back then you were big in polls, had backing from Gene, did movie scores etc, where is your backing today? - This is 2010, and we´re fortunate enough to have a licensing deal with Frontiers, who are one of the biggest record companies these days. We are fortunate enough to have a fair deal, and major company backing. It is harder to day and we do a lot of PR ourselves; in chat rooms and on message boards etc.
' Speaking about yesterday, “The Right to Rock” was rereleased simultaneously, and it was augmented by a new version of the title track. What was it like recording it again? - We felt that it is such an iconic song that has survived well. We wanted to try it with new technology, and give it some more kick. It was a major difference, plus the fact that this time around Brian does the solo, and not me as in the original version. It is also a fact that the album was released during the vinyl days, before the arrival of the CD, which is another reason to rerelease it.
' What would you say caused the break –up in 1988? Over here it seemed you didn´t get along back then. What was the truth? - I must point out that Ron and I have always been friends. There were no fights, but a rather amicable split. The situation was mainly due to the addition of a keyboard player, which wasn´t what I wanted. I pushed to go back to our roots, towards “The Right to Rock”. In the end I wasn´t interested in pursuing a more commercial direction, but I didn´t want to argue with Ron. Instead I started COLD SWEAT, and later on Ron actually covered songs of mine. That way we kept in touch over the years.
' The band is almost back in original form, but with Geno Arce on bass instead of Kenny Chaisson. Why is that? - Kenny wasn´t up to it, he has a family, a job and all that. He is also a very private person, which we respect. The rest of us wanted to celebrate 25 years though.
' Tonight you´ll be on stage in Stockholm playing to a host of festival goers of various ages, what kind of an audience do you expect? - In the States we get mainly old fans of the genre. But many of them bring their kids, plus there is a new generation coming. Kids’ don´t really know about KEEL, many of the young people are younger than our first record. I do like the mix at festivals; that is the charm of it. We also hope that this will be one of more gigs in Sweden in the years to come. There are also plans to a new album out in 2011.
' Well, Marc, cheers for your time, it´s been a pleasure. I really like the fact that KEEL is back, and that the fire still burns. KEEL was a kick in the groin back in the 80´s, I don´t see a reason why they shouldn´t be just that in the 21 century too.